One of the things that comes to mind when I think about Valentine’s Day is chocolate! A box of chocolates is always a great gift, but wouldn’t it be great to do something a little more personal to show that special someone how much you love them? How about baking a delicious chocolate cake? Pamela’s Products has an award winning line of Gluten Free of ready-made desserts and baking mixes that are sure to please. They are perfect for those of you who are Celiac or follow a gluten-free diet. Of course, they are also wonderful for the rest of us who don’t eat a special diet. Neither John and I have issues with gluten and we both LOVE Pamela’s Products and their line is great for everyone to enjoy. 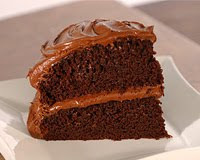 For you chocolate lovers, they have a delicious chocolate cake and frosting, brownies and chocolate chip cookies. If you prefer other flavours, they have vanilla cake mixes, shortbreads and biscotti. I love sweets so this all sounds good to me! I received Dark Chocolate Frosting Mix, Chocolate Cake Mix and Dark Chocolate, Chocolate Chunk Cookies from Pamela’s Products. John and I dug in right away to the box of cookies (ready-made). They were so yummy ! It was hard to stop at just one and I didn’t! The chocolate flavours were amazing and I love biting into the rich chocolate chunks. I couldn’t even tell that this was a Gluten Free product. These cookies are made with 89% organic ingredients and are also wheat free and non-dairy. Mmmmmm….chocolate cake! I am salivating remembering how good it turned out! It was so moist and rich and very chocolatey! It was like biting into a little piece of heaven. The Dark Chocolate Frosting was literally just “the icing on the cake” and made it even more divine. John loved it and asked for seconds. It was also super easy to make and surprisingly, it turned out amazing. I normally screw up every recipe I make, but this cake turned out perfect. If you want to make a chocolate cake to impress, try this mix and frosting! Pamela’s Products are available at Natural Health Stores and some grocery stores. You can also buy their products at Amazon.